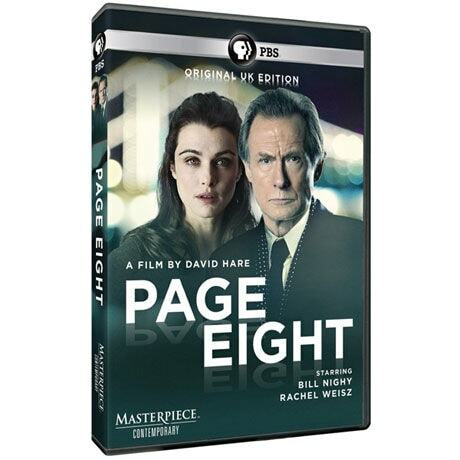 Johnny Worricker (Bill Nighy) is an MI5 officer whose life has just been turned inside out. When his boss and best friend (Michael Gambon) dies suddenly, Worricker is left to deal with a contentious Top Secret file that threatens the entire MI5 organization. Further complicating his life is a chance encounter with his beautiful neighbor (Rachel Weisz). The more duplicity he uncovers, the more desperate he becomes to find someone he can trust. 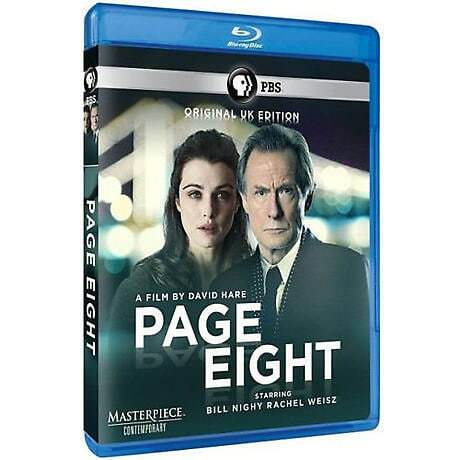 Seen on Masterpiece Contemporary, written by David Hare (The Hours, The Reader), this spy thriller features an outstanding cast including Bill Nighy, Rachel Weisz, Judy Davis, Michael Gambon, and Ralph Fiennes. 105 min, 1 DVD or Blu-ray disc, SDH. Bill Nighy and Rachel Weisz head up an outstanding cast - including Judy Davis, Michael Gambon, and Ralph Fiennes - in "Page Eight," a contemporary spy thriller from David Hare, his first original screenplay in two decades. Johnny Worricker (Nighy) is a long-serving MI5 officer whose life - both personal and professional - has just been turned inside out. When his boss and best friend (Gambon) dies suddenly, Johnny is left on his own to deal with a contentious top secret file that threatens the sanctity and stability of the entire MI5 organization. Further complicating his life is his suspicion that a chance encounter with his beautiful neighbor (Weisz) was, in fact, meticulously orchestrated to serve her own secret agenda. Bill Nighy, Rachel Weisz, Michael Gambon, Tom Hughes, Judy Davis, Rakhee Thakrar, Saskia Reeves, Ewan Bremmer, Felicity Jones, Richard Lintern, Holly Aird, Andrew Cleaver, Kate Burdette, Ralph Fiennes, Alice Krige.